Raised as a girl, Theo Ramos felt more like a boy. It was May of seventh grade, and 14-year-old Theo Ramos was in a new school. Perhaps because it was an arts magnet program, or because it was a diverse place, kids and adults seemed to embrace the transgender boy much more than those at his old school did. There were fewer nasty comments, less bullying. Raised as a girl, he felt more like a boy. He wanted to be called Theo instead of the name he was given at birth — he wrote a detailed letter to teachers, explaining which pronouns he preferred and citing school policy on LGBTQ inclusion. Always a tomboy even before he even knew the word transgender, he dressed in slouchy pants and black hoodies. He liked to hang out with skater guys in his neighborhood. In those days, he longed to take testosterone. He begged his mom. He contemplated “top surgery,” or gender reassignment surgery. Theo Ramos (left) does his mother Lori’s hair at their home in Homestead, Florida. Lori believes Theo’s gender dysphoria is a component of the teen’s overall depression, not the root cause. Now, Theo said, he attributes about 15 percent of his anxiety and depression to gender issues; it used to be 95 percent. Ever since Lori Ramos learned of Theo’s gender dysphoria, she’d been in favor of her child identifying with whatever gender made him comfortable. But taking potentially irreversible hormones was another matter entirely — she said she wanted to postpone that as long as possible. Any transitioning teen’s journey is difficult and fraught with indecision, anxiety and worry — by the teens as well as their parents. TV shows, books and articles often portray people who are extremely certain they want to be a different gender. Reality is different: a continuum or a range, doctors say. A trans teen might feel like a boy one month, and genderfluid — not having one fixed gender identity — the next. That’s one reason therapy is recommended. Lori had been a hesitant mother from the start, but that had nothing to do with her support of Theo’s gender. She said she never wanted Theo to undergo permanent changes unless he’s absolutely sure. “What are the long-term health effects of T-therapy?” she often wondered. And there were insurance issues. Testosterone could be expensive, and the family’s insurance might not pay. 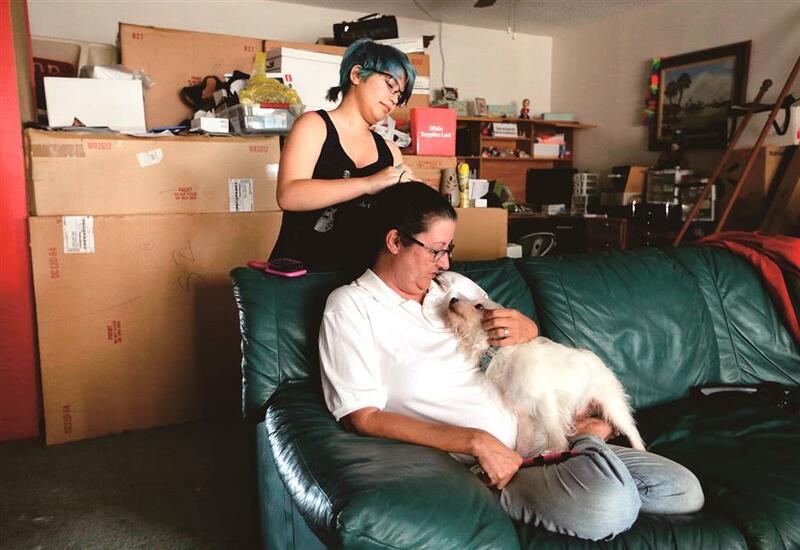 By the end of Theo’s seventh-grade year, Lori had stopped working to devote time to Theo. 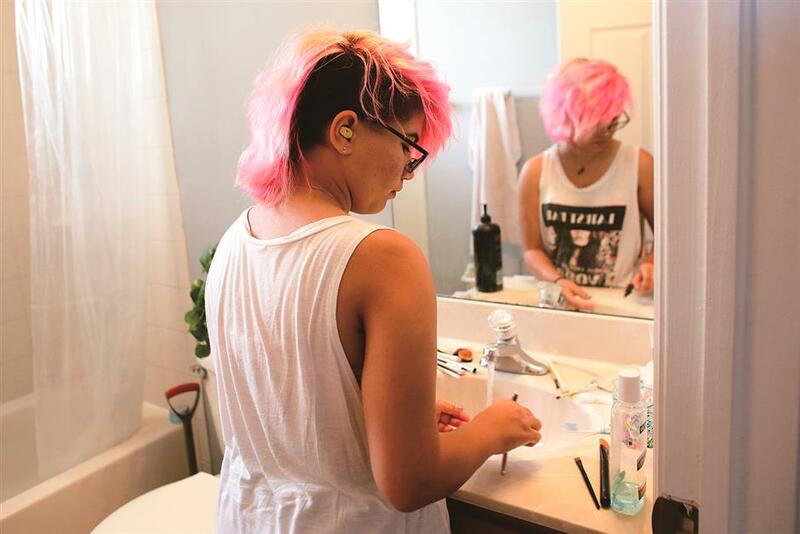 Teen Theo Ramos cleans makeup brushes at home in Florida. Ramos is embracing his gender fluidity, meaning that whether he identifies as male or female can change, depending on day or mood. Having a child with a history of self-harm, who was diagnosed with depression and gender dysphoria, wasn’t easy. Plus, Theo had thyroid problems, other medical issues. Doctor visits and counseling became the norm, with Theo missing school. But there was good news, too: Theo had stopped cutting himself and throwing up. He attended a Rainbow Group for LGBTQ teens — it helped his mood. Research shows that transgender people often suffer from mental health conditions; it’s unclear whether those stem from external factors such as discrimination and bullying, or internal factors such as gender dysphoria. Studies have shown that depression and a risk of suicidal thoughts increase with age. Lori became vigilant, watching her son for signs of suicide or more cutting. Over the summer of 2016, after seventh grade, everything seemed to be OK. Theo played video games, read, texted with friends and painted in his room. Regular teenage stuff. He also acknowledged his sexuality, or tried to, and grasped that his gender was separate from his sexuality. First, he landed on bisexual as a preference: “If I find you aesthetically pleasing, I probably want to get in on that aesthetic,” he joked. But to Lori, it didn’t matter — she wasn’t letting him go on dates anyway. “I date,” Theo insisted, rolling his eyes at his mother and shaking his turquoise pixie haircut. Her concerns also centered on school. In August 2016, Theo began eighth grade, already older than many of his peers — he’d been held back a grade — and he turned 15 two months later. Soon after, he walked up to his mom as she read in their living room. “I might be gender fluid,” Theo announced. Maybe he’d like to wait until he’s an adult to take testosterone, Theo told his mom. A year later, as Theo and Lori remembered this story, the day he told his mom he’d discovered even more about his gender identity, the pair were lovingly sarcastic with each other. But sometimes, it seemed to Lori that maybe she didn’t know her own child.